There is a unique program coming to Charlotte as part of Holocaust Remembrance gatherings. There are 18 violins that had been repaired by a special shop in Tel Aviv. These violins are no ordinary musical instruments but instead were once owned by Jewish musicians who played them in the death camps and ghettos of World War II. For the last several years Amnon Weinstein has been on a quest to find these special instruments and has scoured the attics and basements around the world. Now these fully restored violins will be part of a musical celebration honoring their previous owners. All of this points out that there may be some very special treasures in your own attic that should be brought down from the dust and cobwebs. If you are lucky then you’re living in a Charlotte house that has been part of your family for generations. When that is the case there is no telling what kind of treasures might be up in that attic. 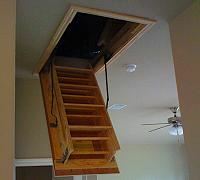 The typical attic becomes a family’s go to storage zone. This is where all the unwanted furniture, clothing, heirlooms and other stuff get stored. Usually there are a couple of suitcases or trunks that might be holding precious keepsakes. There might be some photos of long forgotten family members that could be put into new antique frames for display. Because Charlotte played a vital role in Civil War history there is also a pretty good chance there might be some memorabilia from this era that could fetch a decent price at auction. Obviously, you’ve got to go on your own attic scavenger hunt to find these items and that’s a perfect way spend a Saturday afternoon! While there might be a few pieces that are worthy of display it could also be that there is just a lot of junk up in that attic that needs to be tossed out. If you make that kind of discovery then you should have a professional team of junk haulers like Junk King Charlotte standing by to take away all of that garbage. The great thing about having professional junk haulers work with you is that they’ll make the climb up and down the attic steps. All you have to do is supervise. Once your attic is clear of treasures and junk you might discover that it’s a perfectly viable space that can have many purposes. It might not take a lot of work to convert an attic into a spare bedroom or home office. It could even become your kids’ playroom. You’ll be amazed at what a little dry wall and fresh paint can do! Keep in mind, that as long as you’re cleaning out your attic and having Junk King Charlotte take away all that garbage you also put them to work in other areas of your home. This could be the perfect excuse to finally clear out the clutter from your closets, basements and garages. Who knows? You might find treasure there as well! This entry was posted in Attic Cleanout, Charlotte Furniture Disposal, Charlotte Junk Hauling, Charlotte Junk Removal, Junk King Charlotte and tagged Attic Junk Removal, Charlotte Junk Removal, Junk King Charlotte, NC Junk Hauling on April 16, 2012 by Terendius David. Last updated August 2, 2017 .